The amount of privacy you need in a room is one of the biggest things for you to consider when you are choosing the design of your window treatments. If the room does not require a lot of privacy, then you might choose to put up a simple valance, or build a decorative cornice over the top of the window. You might decide to hang sheer panels over the window to diffuse the light a little or to add a softer look to the décor of the room. These choices would not be appropriate for a bedroom or bathroom where more privacy is required. If you are treating windows in a bedroom or bathroom, you want to provide the ultimate amount of privacy and yet you also want to create an attractive look. You can still make the room have a softer look by hanging roller shades that will pull down and completely obliterate the outside view and hang beautiful sheers over the shades. You would attach the curtain rod supporting the sheers to the section of window above the sill so that the sheer hangs in front of the window and softens the look. You can experiment with layering different products when you want to create different looks in the room. If you work shift work then you know there are times that you need the room to be dark during the middle of the day. You can achieve this dark simulation by using black out shades or really heavy draperies. Blackout shades can be purchased in several different styles so you can get a look you are happy with and the light control that you need. The window treatments should follow the design you used to create the décor of the room. That does not mean that you have to have purple curtains because you have purple walls, it means that you do not want to have a masculine room and hang a frilly valance over the window. If the room was masculine, you would want to hang a Roman shade or roller shade that fit with the color and scheme of the room rather than a valance and draperies. 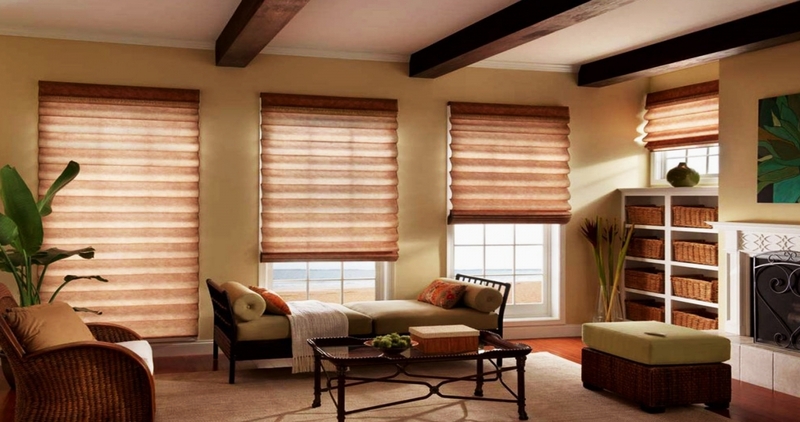 You can always use wooden blinds in a room that is very masculine. When you are choosing the fabric for the window treatments bear in mind what the room is used for. You want tightly woven fabrics to help reduce light in bathrooms and bedrooms and lighter fabrics in the kitchen and dining room. The thickness and weave of the fabric will enhance the performance of the treatment you choose. You can make simple shades out of old curtains you might have. You can take an old curtain, or an old tablecloth and attach it to tension rods at the top and the bottom portions. Place the rods inside the window sill and you will have instantly made a new shade for your room. You can take roller shades and embellish them using stamps and stencils. You can create one of a kind pieces of art that hang over your windows. You can also order custom made shades that have images you provide printed on them.